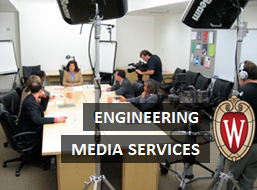 Engineering Media Services (EMS) maintains the media equipment in many of the College of Engineering conference rooms, classrooms, and labs. We offer a variety of services and hands-on assistance to the Engineering community. From recording in the Engineering classroom to a offsite lab vist, EMS can help you accomplish a multitude of technology needs. Are you having problems in our rooms? Feedback, questions or accessibility issues: dusty.smith@wisc.edu.